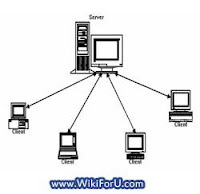 Client-Server Model: Client-Server Model is one of the types of Networking Model. It is mostly used networking model in today's life. In Client/Server Model, a central device that is Server is placed to control all the communications between server-client. In this fashion, various computers can be connected to a server. These connected computers are called nodes. If one node needs to communicate to another node, then it must go through the server. Thus in Client-Server model, data or resources cannot be accessed or shared independently or individually by clients. In Client Server model, as we uses a central device, so this enhances the security of the data and information. Server is the head in the communication. The configurations of a server are mostly higher than normal computers. There is some special operating systems which are used on the server, such as Windows Server 2000, Linux etc. In client server model, everything is based on request. Any computer (client) in the network can send a request to the server for accessing some specific information or resources. Then the server will respond to the request. And as we configured the server it will grant or deny access to that information or resource according to the settings that we configured in the server. All Client Server protocols operate in Application Layer. There are many advantages of using Client Server model instead of Peer to Peer Model. As in client server model, we have complete control over communication, We have added security features and we can also connect a large amount of computers or clients as compared to Peer to Peer Model. Client-Server Model provides many security features. We have full control over communication. Have more abilities as Server may have large HDDs and Resources. It is very expensive as we need to buy a server. It is very complex. A special trained technician can handle the maintenance of the server. If the Server goes down due to some problem, the whole network will be down and there will be no communications until the Server is Up. Dear! ARE u Giving Backlinks for guest Author? If yes then I Will write For You. . . Yes Dear Basheer. But that depends on the type of blog whether they are Dofollow or Nofollow . I shall be glad to see your article.